Feed at regular times (at least twice daily) with three daily feedings preferred, when feeding rates exceed 1% of body weight. Any feed changes should be made gradually over a period of 7 to 10 days. 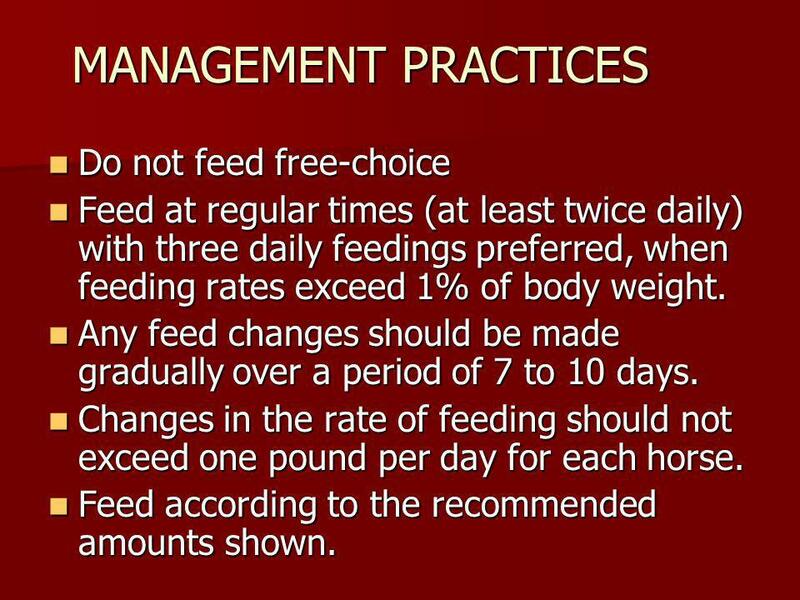 Changes in the rate of feeding should not exceed one pound per day for each horse. Feed according to the recommended amounts shown. 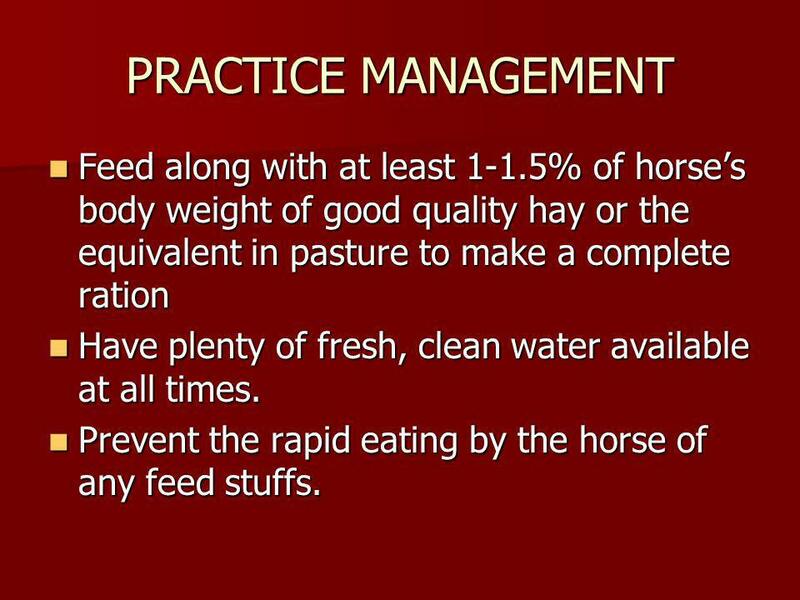 5 PRACTICE MANAGEMENT Feed along with at least 1-1.5% of horse’s body weight of good quality hay or the equivalent in pasture to make a complete ration Have plenty of fresh, clean water available at all times. Prevent the rapid eating by the horse of any feed stuffs. 6 PRACTICE MANAGEMENT Store feed in a dry, well ventilated area protected from rodents and insects. Do not feed moldy or insect-infested feed to animals as it may cause illness or death. In addition to nutritional care and consultation, be sure to make regular veterinary checkups and farrier appointments part of the horse wellness program. Maintain an effective control program for internal parasites. 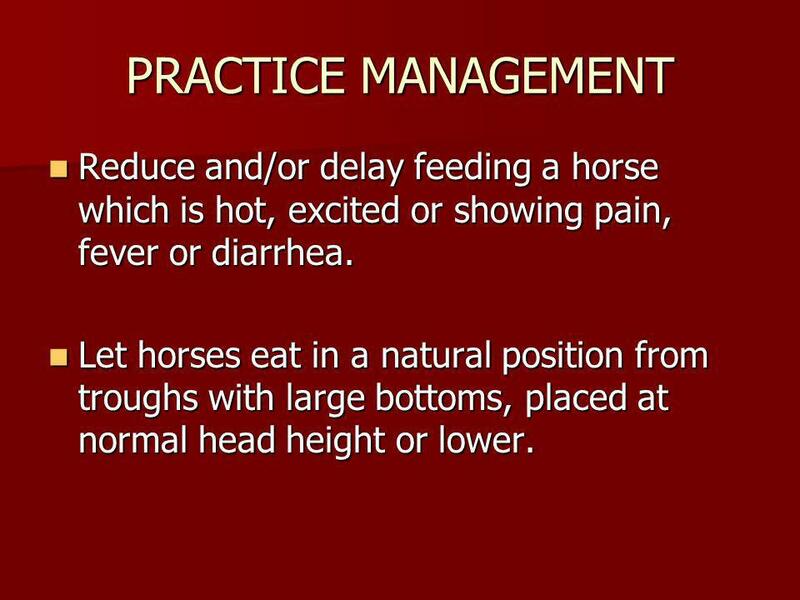 7 PRACTICE MANAGEMENT Reduce and/or delay feeding a horse which is hot, excited or showing pain, fever or diarrhea. Let horses eat in a natural position from troughs with large bottoms, placed at normal head height or lower. 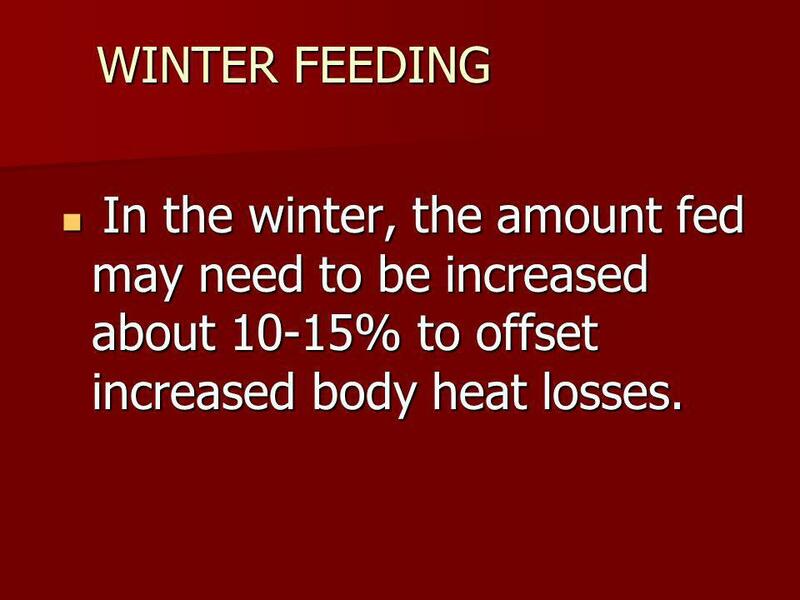 8 WINTER FEEDING In the winter, the amount fed may need to be increased about 10-15% to offset increased body heat losses. Feed at the same time every day. Avoid sudden changes. 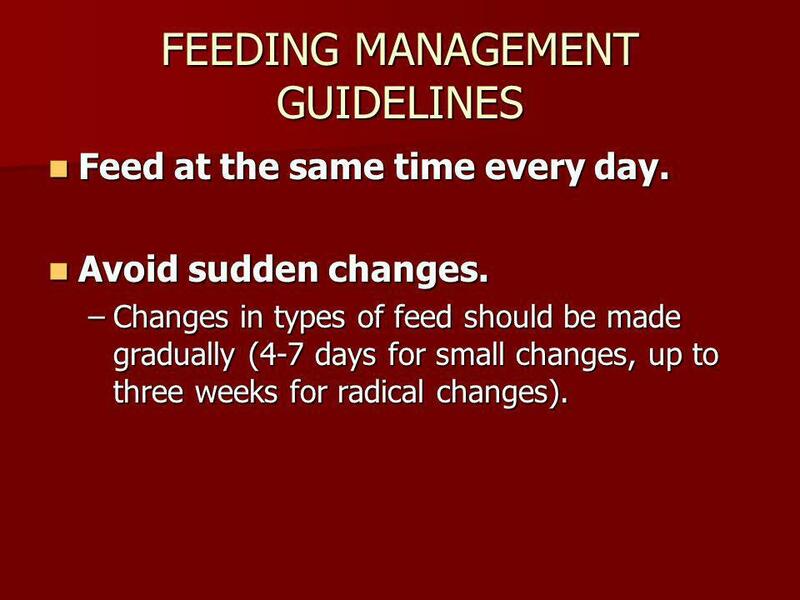 Changes in types of feed should be made gradually (4-7 days for small changes, up to three weeks for radical changes). Provide clean, fresh water. Exercise horses regularly. Check teeth regularly. 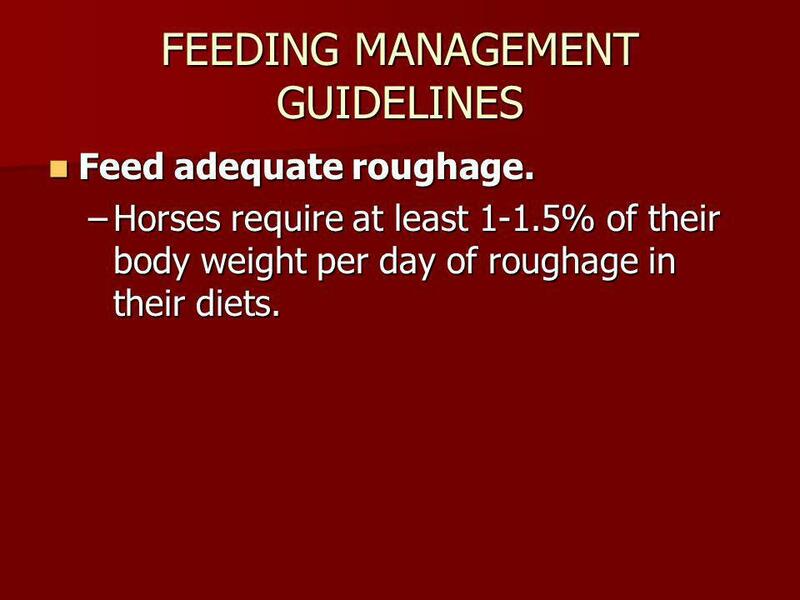 Feed adequate roughage. 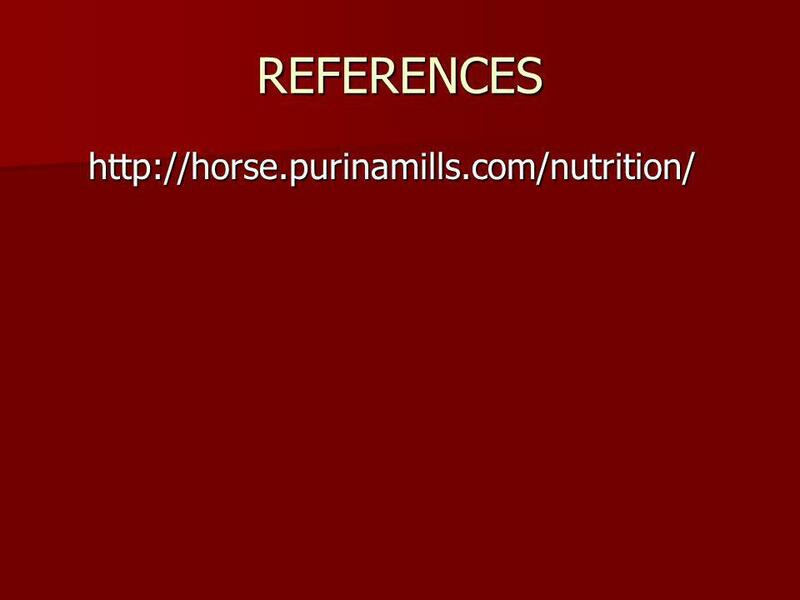 Horses require at least 1-1.5% of their body weight per day of roughage in their diets. Use only top quality feeds. 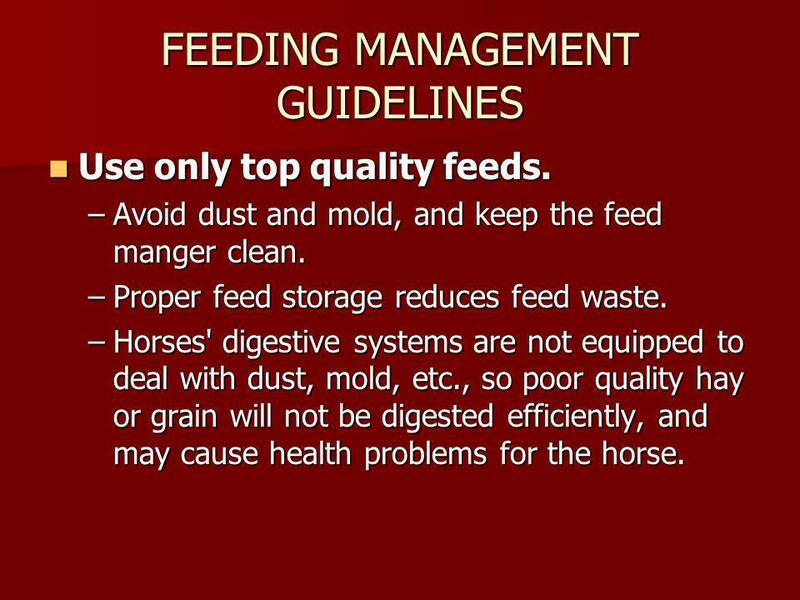 Avoid dust and mold, and keep the feed manger clean. Proper feed storage reduces feed waste. Horses' digestive systems are not equipped to deal with dust, mold, etc., so poor quality hay or grain will not be digested efficiently, and may cause health problems for the horse. 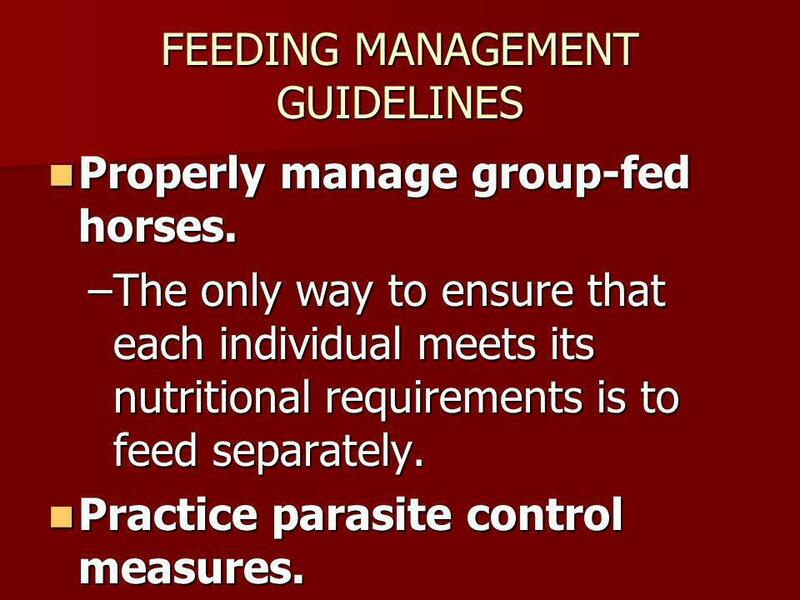 Properly manage group-fed horses. The only way to ensure that each individual meets its nutritional requirements is to feed separately. Practice parasite control measures. Keep an eye on horses' droppings. Changes in consistency, color, odor or composition of feces may indicate a digestive disorder. 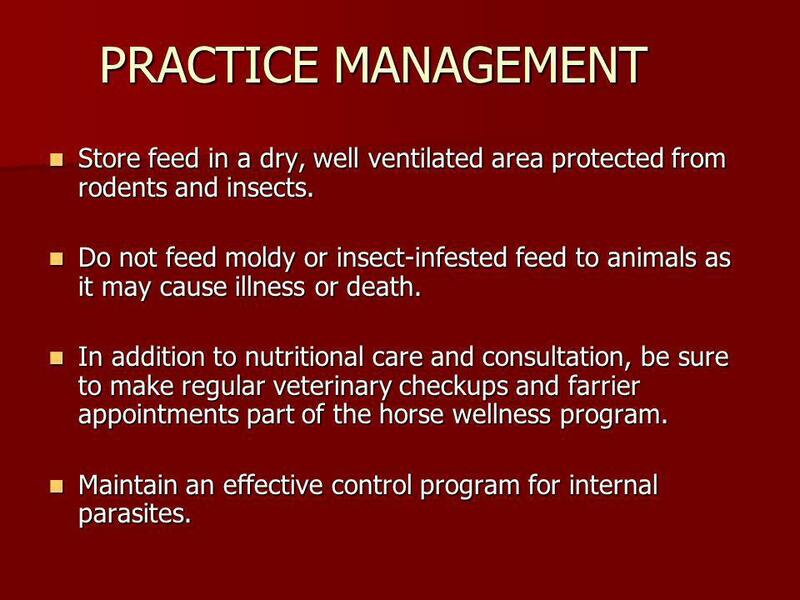 Practice routine veterinary maintenance In order for a horse to get the most out of its nutrition program, it must be in good health. 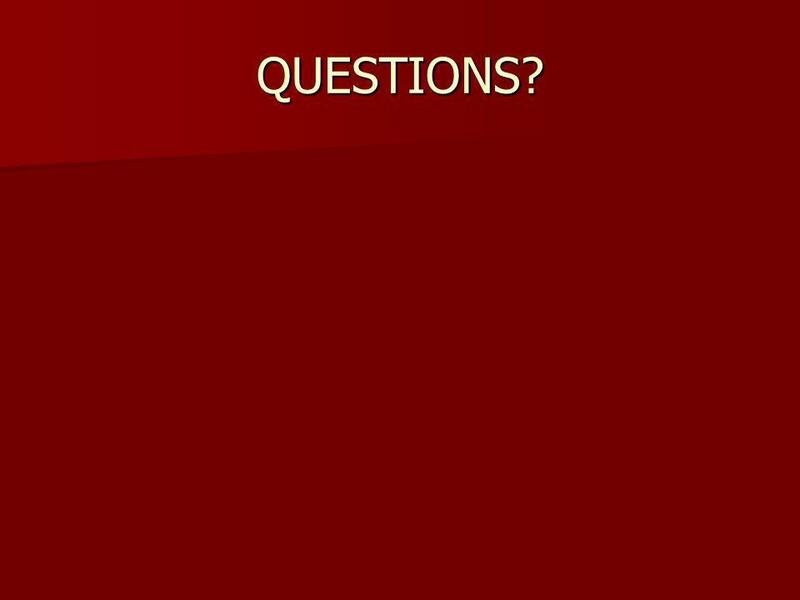 Regular vaccinations, deworming, etc. are all essential elements of a good overall wellness program for the horse. 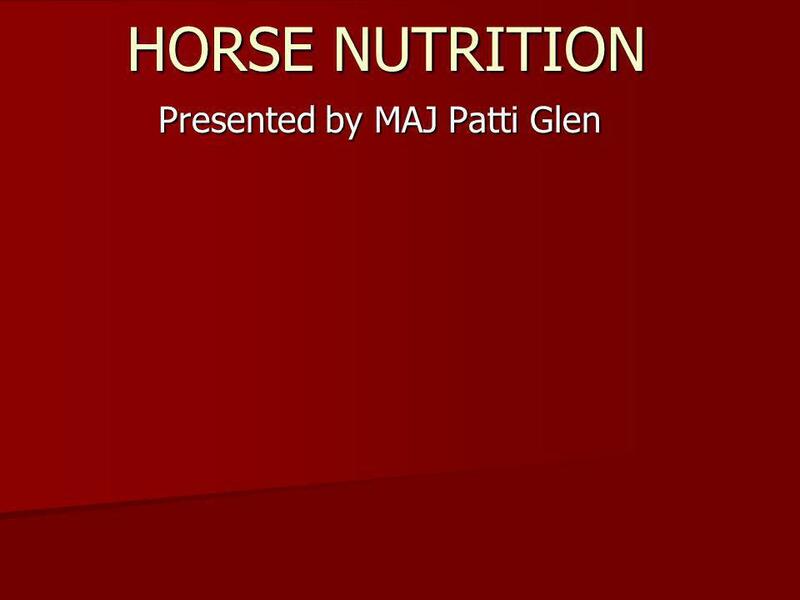 Download ppt "Presented by MAJ Patti Glen"
Level One Diploma in Land-based Studies- Horse Care Unit 134 – Maintain the Health of Horses. 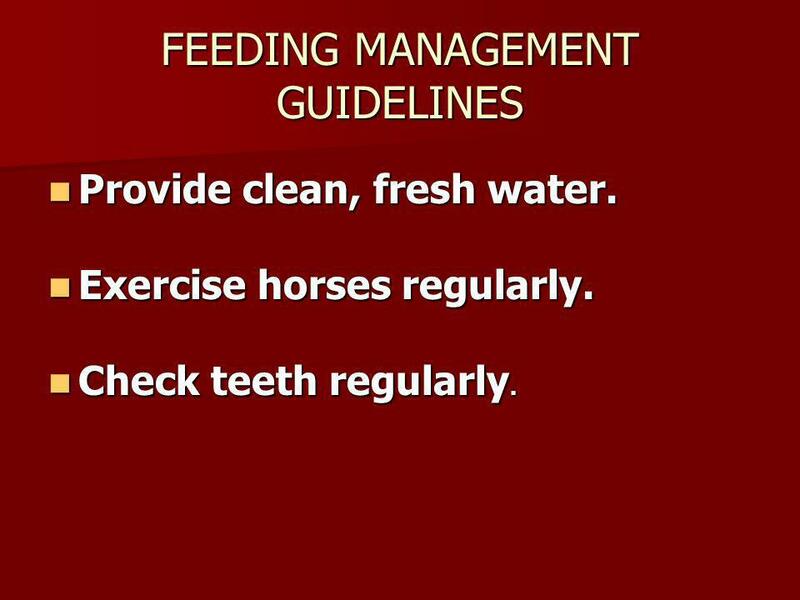 General Feeding Practices Colic. How Much Water Should a Horse Receive? At rest at moderate environment eating dry forage: 0.3 to 0.8 gal/100 lbs BW Amount. 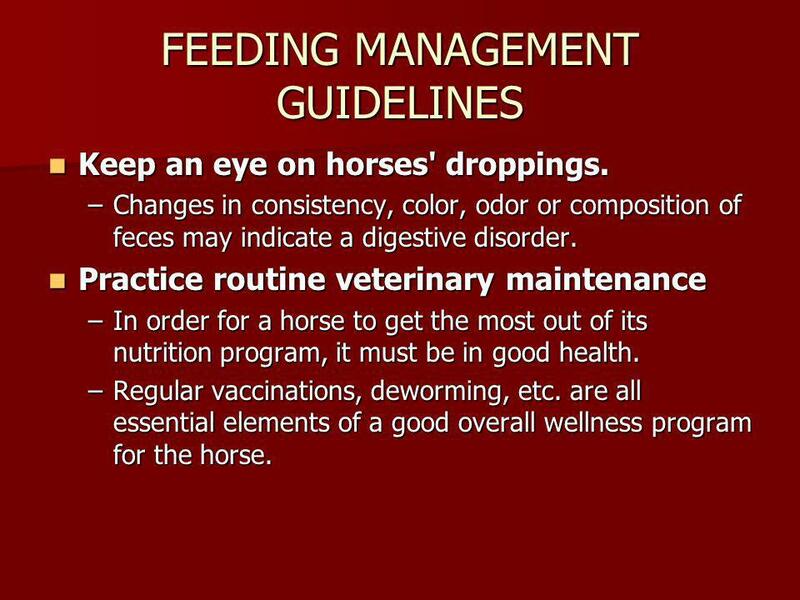 COLIC BUGS VALUE ADDED PRODUCTS FEED MANUFACTURING PRACTICAL GUIDELINES Equine Nutrition. Rabbit Essentials Texas 4-H and Youth Development. Evaluating Hay Quality Terry E. Poole Extension Agent Frederick County, MD. 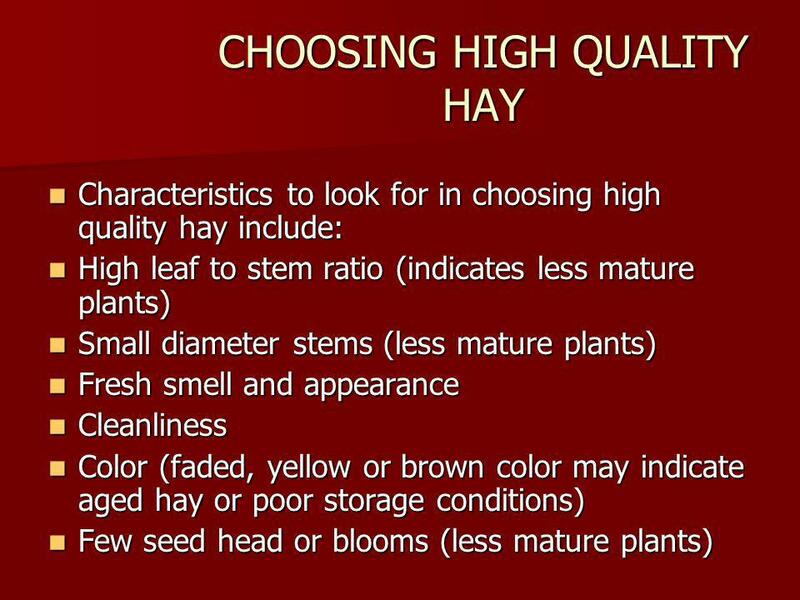 Sensory Evaluation of Hay Mylen Bohle Area Extension Agronomist Oregon State University Extension Service Crook County. Intro to horse nutrition A Phantom Rider’s 4-H guide to the basics of the equine digestive system & horse nutrition Next page Click here to go to the next. 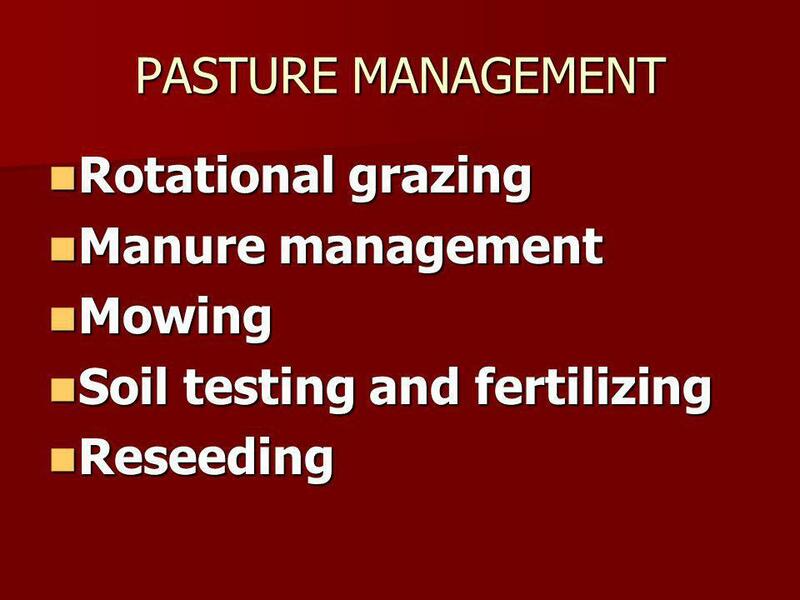 Reproductive Management of Herd Sires By Paul Coe, DVM Michigan State University. Introduction to Pasture Management ANSC 110 August 31, 2010. Biosecurity on the Horse Farm INAG 120 – Equine Health Management December 7, 2011.
why, where and when of Pasture Management Willie Lantz Extension Educator Ag and Natural Resources Garrett County, Maryland. Home Vegetable Gardening. Site selection What to grow Starting seeds Soils and fertility Common pests and diseases.